Welcome to another brand new small business chat, with Deborah Price from Dap Squared Ltd. I came across Deborah via an old friend from London on Facebook who was talking about her friend’s business – it sounded fun and different so I asked if she’d like to take part. We’ve had bras before in this series, and now we’re on to pants and nighties – or I should say lovely boxer shorts and a beautiful nightwear collection. Like many other interviewees, Deborah set up her own business for family reasons – usefully, she already had a wealth of high-level experience, including working in all aspects of the business, which meant that she knew exactly which business area to go into. Hello Deborah, and welcome! What’s your business called and when did you set it up? The business is called Dap Squared Ltd. We have 2 brand labels. The first is British Boxers: we manufacture British made Boxer shorts using the link to my great-great-great-grandfather, the world’s first heavyweight boxing champion, Jem Mace, as the story on the packaging. The second brand is a stunning nightwear collection called Double Dapper which we’ve created using some of the finest fabrics in the word. We set it up in 2012. I’d always wanted my own business, but when my daughter aged 2 1/2 was diagnosed with a lifelong condition called Williams Syndrome I realised that the only way I’d be able to carry on working was if I was the boss. I needed to be in control of my time so that I could take her to medical appointments and give her the attention she needed. Simple. It’s what I knew like the back of my hand. Previously I’d been the Head of Buying at a high-end London-based nightwear company. I knew the factories, the fabric mills and the buyers, too. No, but in my previous job I’d worked incredibly hard and had done every aspect of the process, the design, the buying and costing, the merchandising and the sales, so I was confident in my own ability. How did you do it? Did you launch full time, start off with a part-time or full-time job to keep you going? We moved up North. This mean we had a lower mortgage, and we had space. We shopped in Aldi, We forgot about foreign holidays in the summer and went camping in Wales, I could no longer afford a cleaner. Please don’t ever judge me on the dust. I don’t think anyone is allowed to judge any self-employed person by the dust! So, what do you wish someone had told you before you started? To be a bit kinder to myself. We’ve been through a very difficult time with my daughter and sometimes it’s very easy to blame yourself when really some things are just out of your control. To be honest I think I’d say “Steady as you go” and “As you were” There’s not much I would have changed. I’d have liked to have had some help with the accounts from the beginning. The admin can take up valuable time but conversely I do believe that unless you know what every aspect of your business is about then you’re leaving yourself exposed. It’s important to know how each cog works. I’m so glad I did it. That I left my job and gave it a go. Research your pricing structure thoroughly. It’s absolutely essential to know the pricing of all your component parts to gain an accurate cost. From there you can work out your margin and the price you need to sell at and whether the product is a viable one to bring to market. If your costs are too high, then question how you can you lower them. If it can’t be done, then maybe your product isn’t commercial. Move on. How has it gone since you started. Has it grown, diversified or stayed the same? We started with British Boxers, manufacturing here in the UK and telling the story of my great-great-great-grandfather – The First World Heavyweight Boxing Champion Jem Mace on the packaging. We originally started with the traditional boxer shorts, but quickly diversified into the stretch trunks, too, and from there we have developed a range of nightwear called Double Dapper and it’s stunning. We are using some of the best fabrics in the world. I’m incredibly proud of both collections. Where do you see yourself and your business in a years time? In a year we’ll be selling out product into lots more stores. We’ve already been invited to exhibit at a pretty exclusive trade show and I’m very excited about that. From a difficult time in the family, a lovely business has grown, obviously with a lot of hard work. People who are thinking of selling products will glean a lot of tips and hints from this interview, and I’m grateful to Deborah for that. I hope we see the brands go from strength to strength – do take a look at the website! 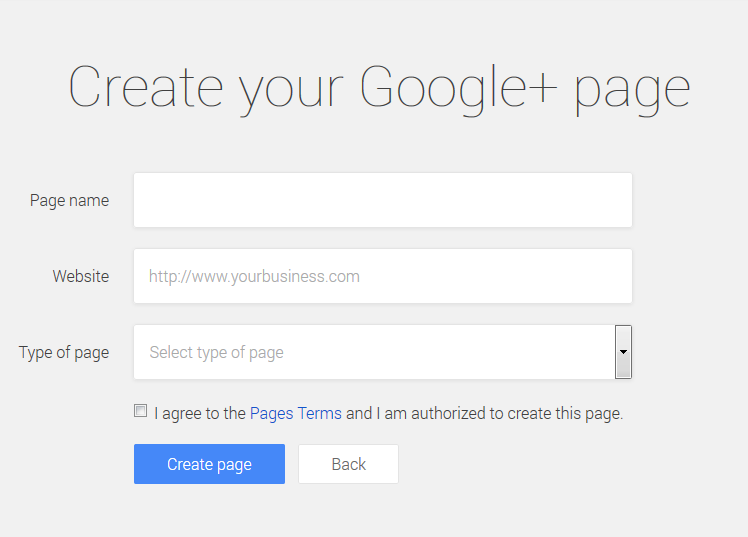 Why should I set up a Google+ account and page? This is a good question, as Google+ is known to be one of the rather less active social media platforms. However, the clue is in the word “Google”. 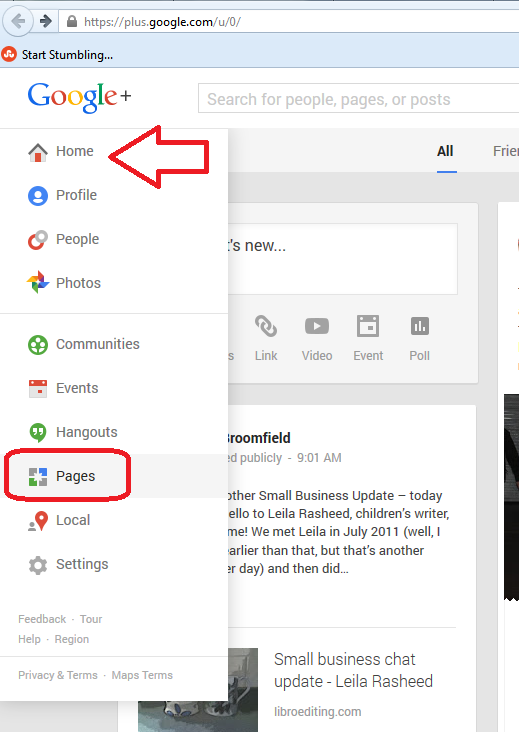 Basically, stuff you post on Google+ and your Google+ page will be indexed more quickly by Google and will appear as more relevant in a Google search. There are active communities in Google+ and Hangouts and other social discussions and groupings – I have to admit that what I personally do is auto-post to Google from this blog and my others, so invest minimal effort, but it is worth doing for the indexing and SEO side alone. 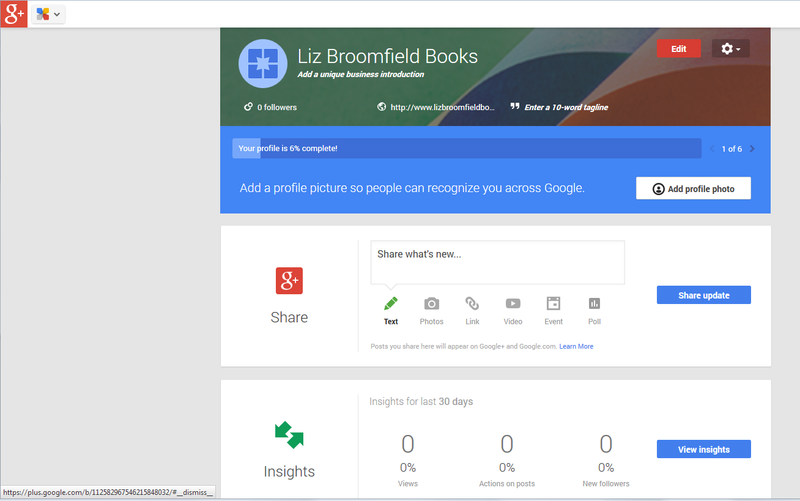 How do I set up a Google+ account? You can see that this looks quite a lot like other social media platforms such as Facebook, with posts by friends, recommended contacts (names deleted for privacy purposes) and a place to post an update at the top. We’re not going to explore personal G+ at the moment, but instead look at the business application. 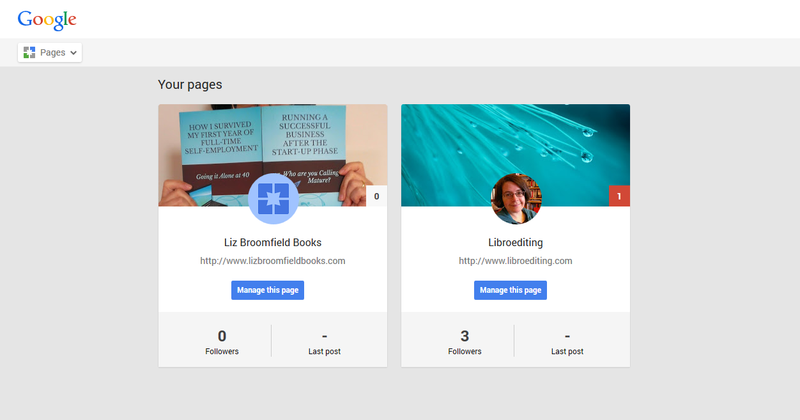 How do I set up a Google+ page for my business? 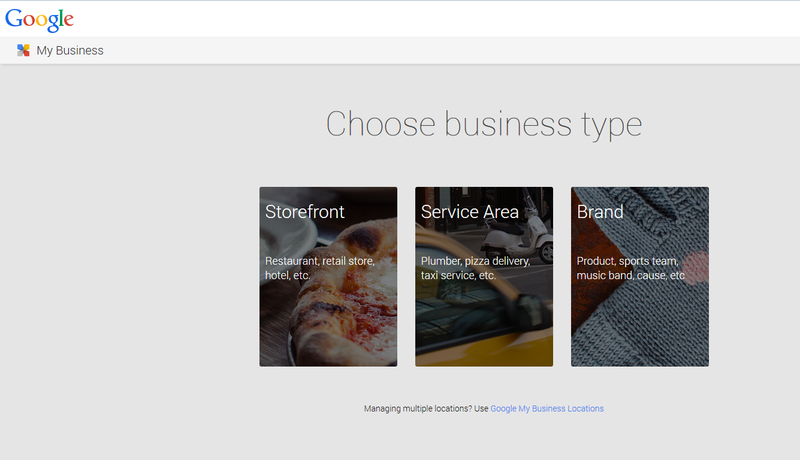 you will get the option to add a business with a street address. 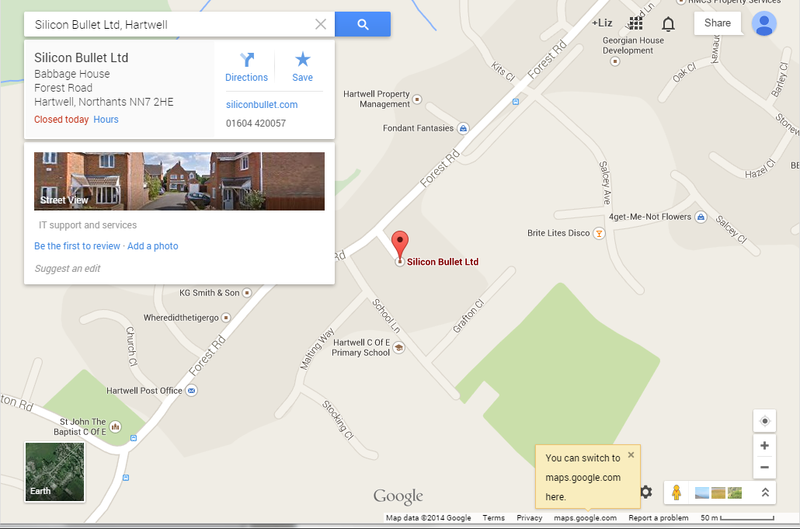 This is great if you have a shop or trading address, for example if you welcome people into a high street shop, have a gym in an out-of-town location or have customers visit your home to collect products, have therapeutic sessions, etc., and if this is the case, you can fill in all the details and have a listing for your business appear on Google maps for prospective customers to see. 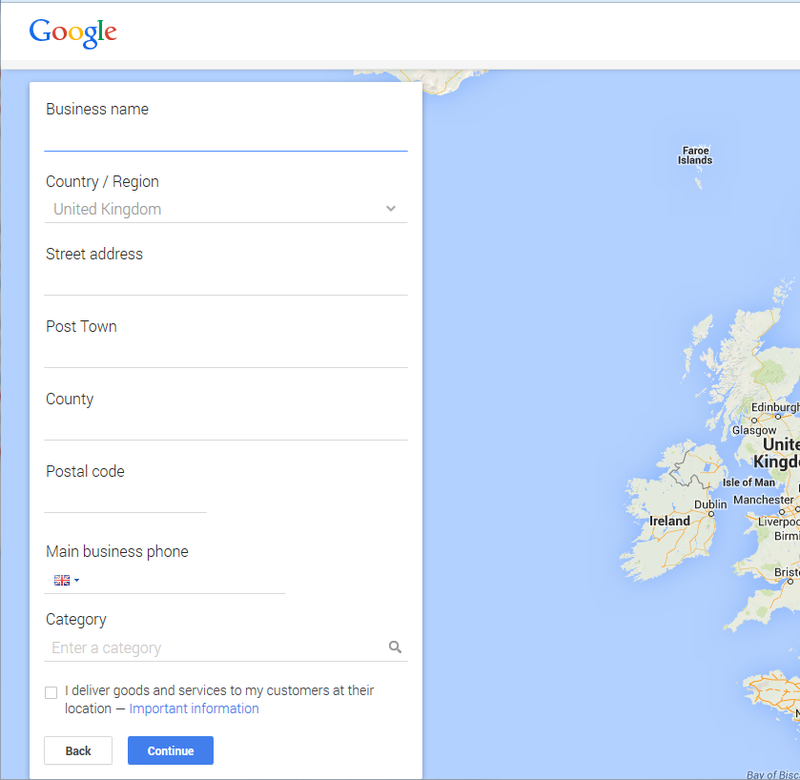 But what if I don’t want to list my address and have a pin on Google Maps? I don’t want to list my address on Google Maps because I work from home, but I don’t see any clients here and I don’t really want the world to know my address! 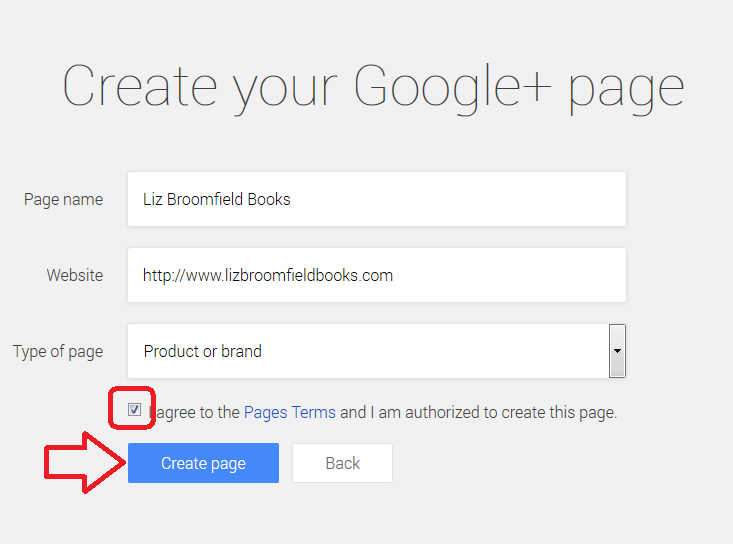 So this is how to set up a Google+ page without your address. Note, you can’t cheat the section above and put in spaces or dots – it really does want to pinpoint your address with a little label. 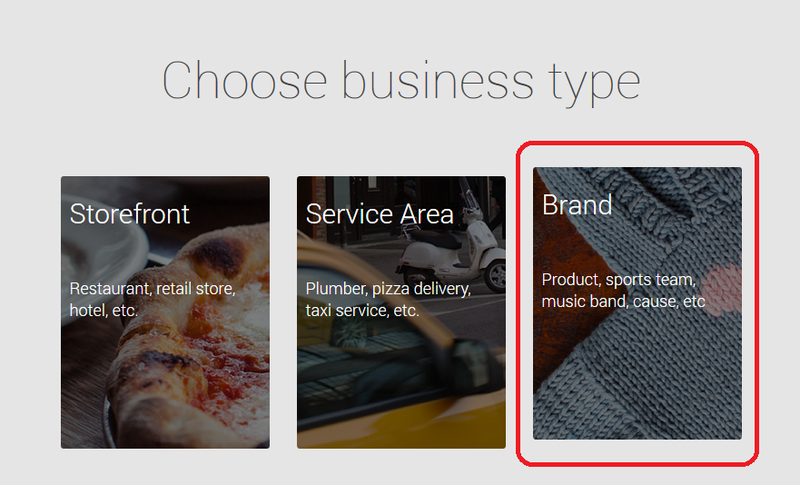 You can add in your URL and select the type of thing you’re talking about – so this is how you set up a community or other non-business entity, too. 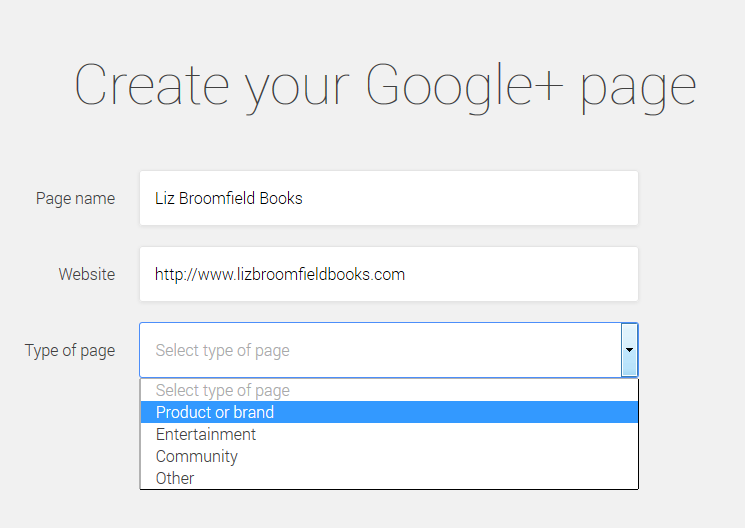 Once you’ve created your page, Google+ will give you a tour or you can just get started customising your page. This is all pretty self-explanatory. For example, you will be asked to complete your profile and given options to share updates. 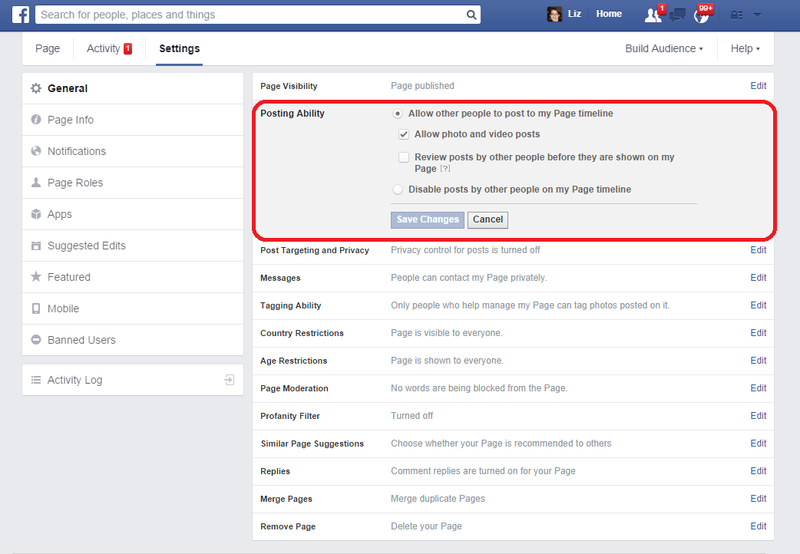 There’s also a section where you can see Insights – how people are interacting with your new page. Once you’ve clicked Change cover, you can choose one of the gallery or upload your own photo (if you have already put up several cover photos, you can click on that link to choose one you’ve used earlier). 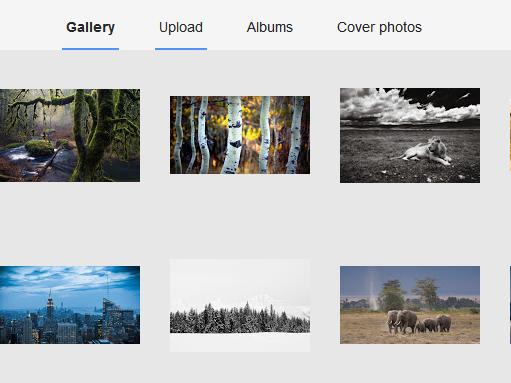 Upload takes you into your own folders so you can choose your own image. Here I’ve added my own image and I can now explore, add updates and add contact information and links. 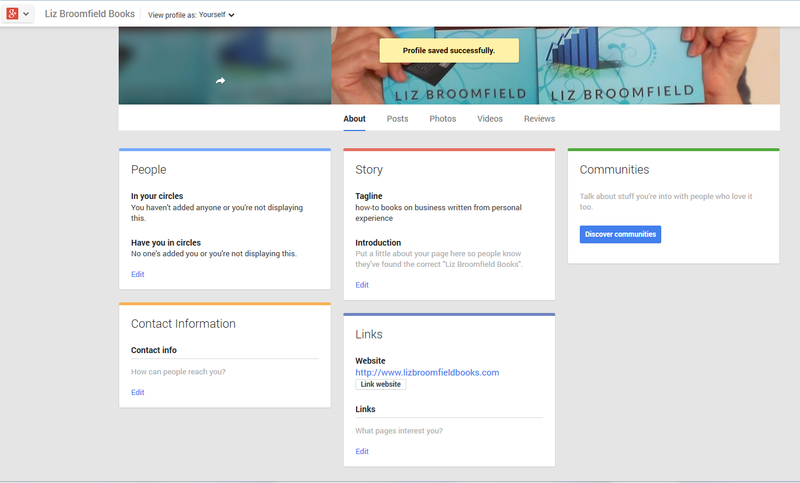 How do I edit my Google+ business page(s)? 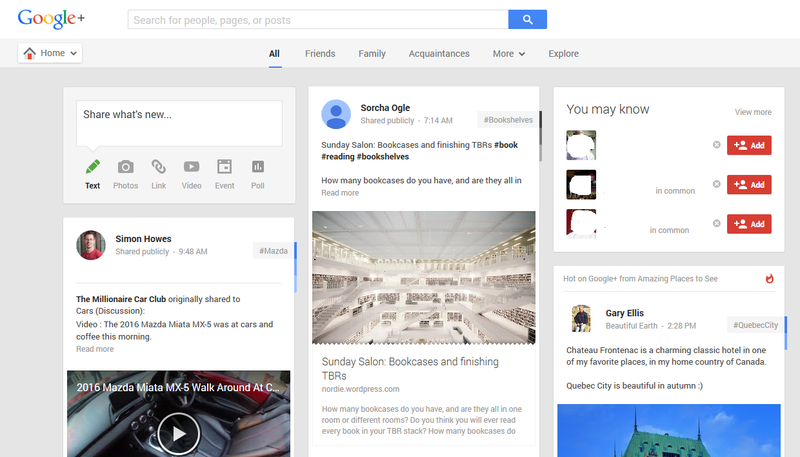 In this post, we’ve learned about Google+ pages and how and why to create them. To learn about more aspects of social media for business, take a look at the resource guide. if you’ve enjoyed reading this article and have found it useful, please take a moment to click on the buttons below to share it! Thank you! 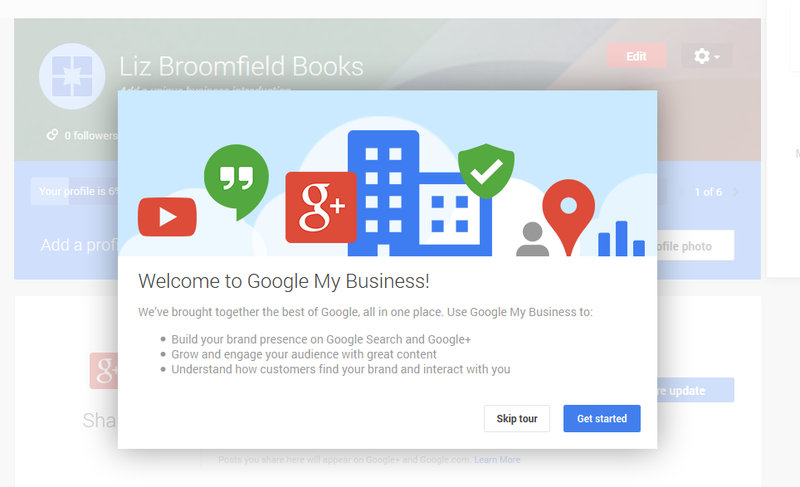 Garrett and Mike from Techfunction Magazine have got in touch to let me know about their resource guide to Google Business – read the first article here. Hello again, Leila! Are you where you thought you’d be when you looked forward a year ago? I think I was over-optimistic, but things are on track. I’ve finished my novel and my agent is pleased with it, so I feel good about how things are going. A few other opportunities have come up too, so that’s good. I have finished the two long contracts for publisher led work, so that leaves me more time to focus on my own writing and on teaching/ development work. That sometimes turning work down is the best strategy, although it goes against my very soul to do so! Hopefully with some of my own books published and doing well, and with some more teaching work established. Ah yes – the turning down work thing. I do it regularly and am lucky enough to have a team of people I can recommend prospective clients on to or pass to my regulars as a back-up, but I’m not sure how you do that in the world of creative writing! I always get excited when I spot Leila’s books in the bookshop – and hopefully we’ll have more to look out for soon! You can find Leila online at leilarasheeddotcom.wordpress.com and I will leave the note below up until the event is over – Leila does a fair bit of teaching, as we’ve learned from her update, and she’s involved with this course, so if you’re in the MIdlands and want to learn more about writing for children and teenagers, do take a look! 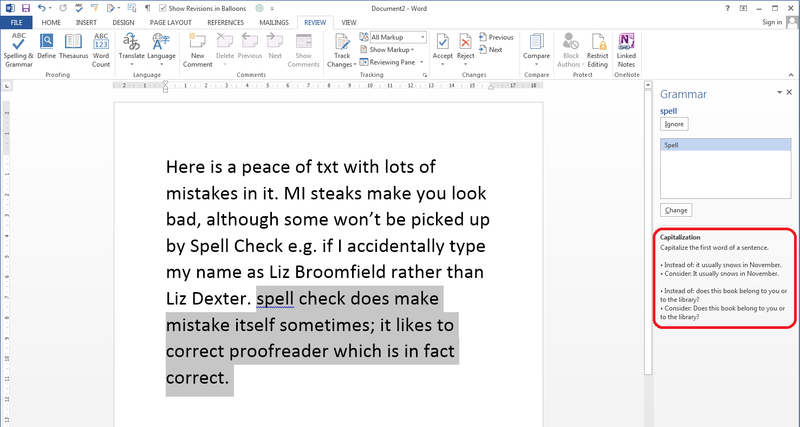 Spell Check in Word checks the spelling and grammar in your document, highlighting any words that it thinks are spelled incorrectly and offering alternatives. It’s always worth using Spell Check, even if you’re an accomplished writer or feel you can edit your own work – we all make mistakes, and this will catch many of them. Note: I’ve added the Spell Check button there because I use it a lot. If you want to learn how to add buttons to the QAT, read this article. Here, I started at the beginning of the text, but you’ll notice that it’s missed out “peace of txt” – see more detail in the main article on this. 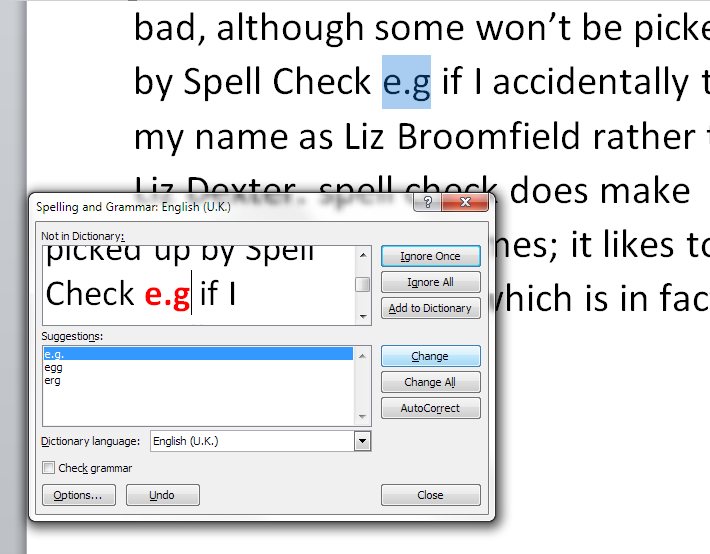 If you own a copy of Word 2013 outright or have a subscription and are logged in, Add to Dictionary will add that exact word to the Spell Check dictionary so it will never ask you ever again if you’ve miss-spelled it. I have used this for my name in the past, which is why this Spell Check process won’t pick up “Broomfield” or “Dexter”, and I also add in commonly used technical terms and jargon that comes up a lot in the texts I work with. 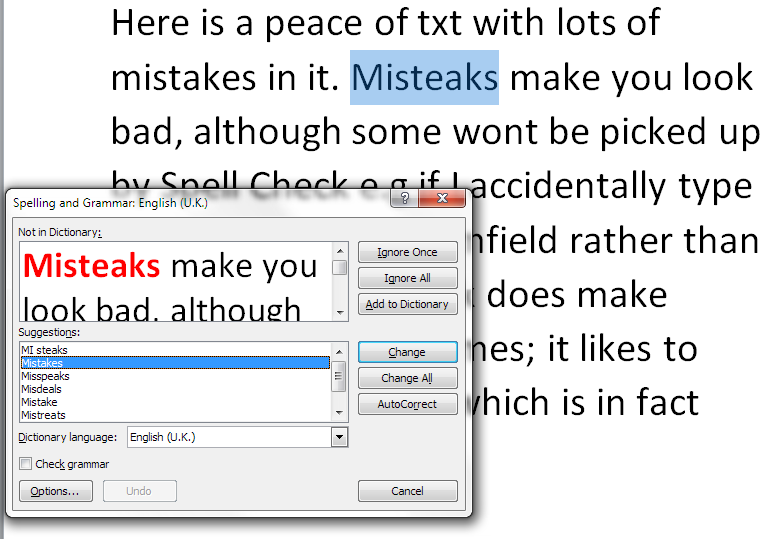 Change All changes every instance of “misteaks” to “mistakes”. 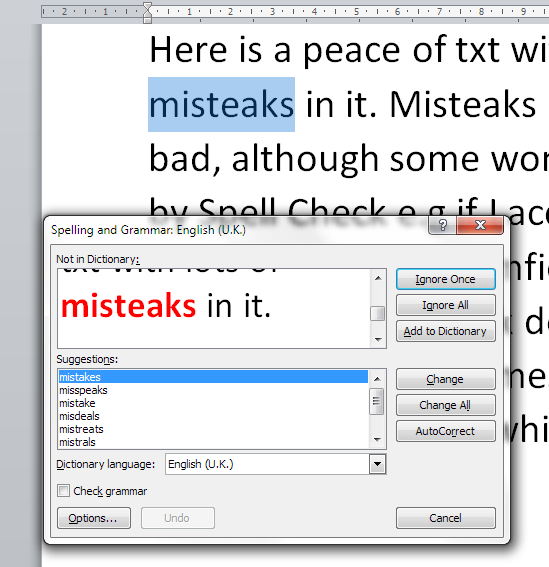 If you own a copy of Word 2013 outright or have a subscription and are logged into your Microsoft Office account, AutoCorrect is available and brings up the AutoCorrect screen (see this article for more on AutoCorrect) which allows you to set up an automatic correction for the future, so whenever you type “misteaks” it will change to “mistakes”. This is really useful if you notice that you’re mistyping a word regularly. 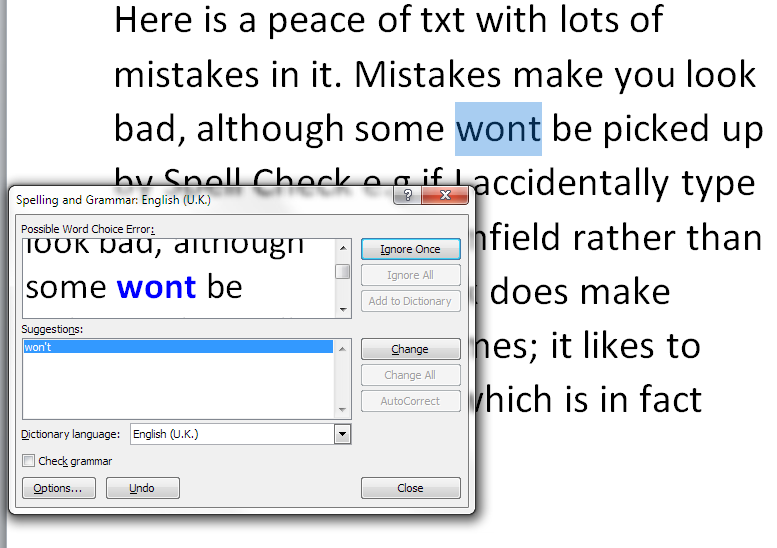 I find the grammar checker to be quite rigid and a bit odd. It’s up to you whether you allow grammar checking, and instructions for tweaking the Spell Checker will appear in a later article. 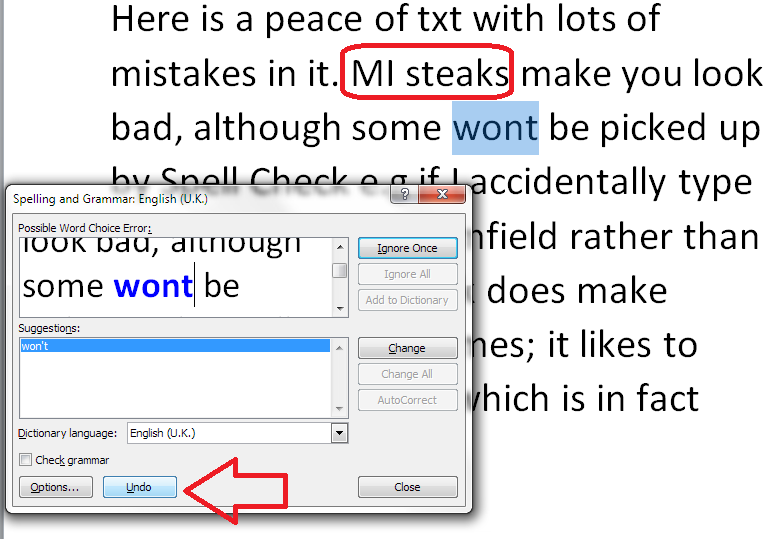 In Word 2007 and 2010 there was a handy button in the Spell Check dialogue box that allowed you to undo previous changes. 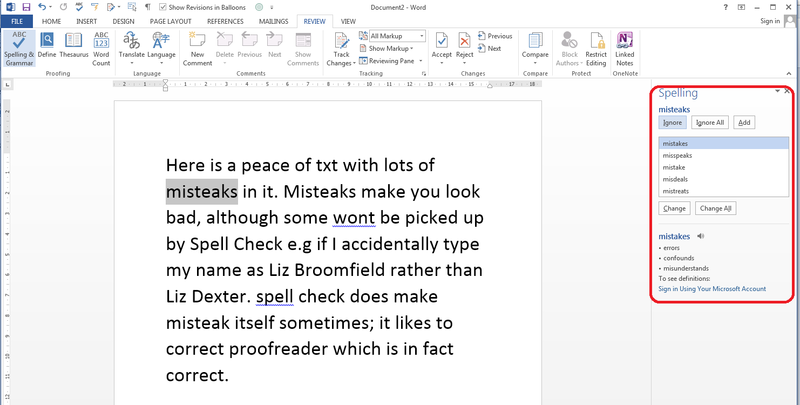 This has gone in Word 2013, so if you realise you’ve made a mistake, you will need to use the Undo button (or press Control-Z) to go back to correct your mistake. In short – yes. See the main article for more explanation and examples. Can I use spell check in other applications ? 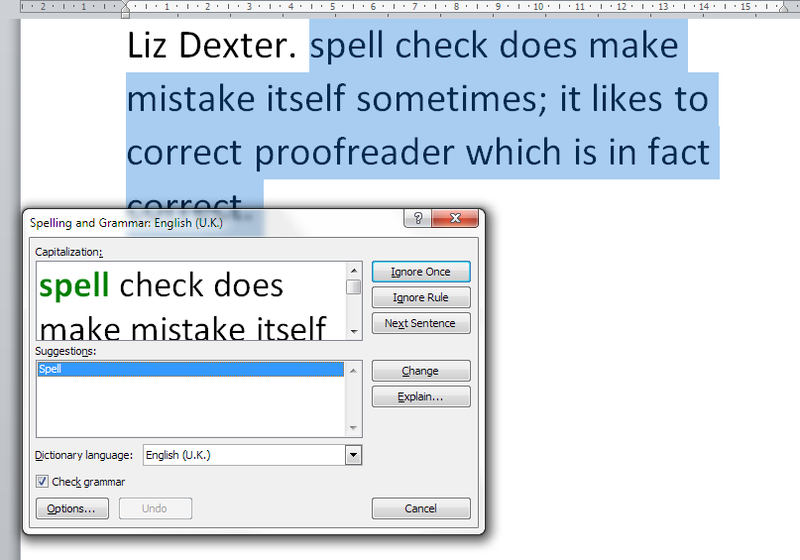 In this article we’ve looked at Spell Check in Word 2013 and how it differs from previous versions. In future articles I’ll be sharing how to tweak your Spell Check settings, how to tell Spell Check NOT to look at particular text, and when to use Spell Check when you’re working with an editor. 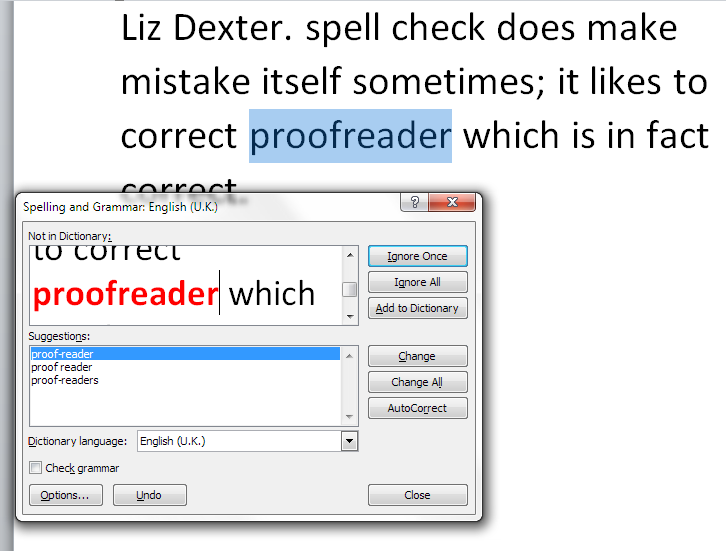 Oh, and there will be a parallel post on Spell Check in Word 2013, too! How do I delete a post or ban a user on a Facebook page? 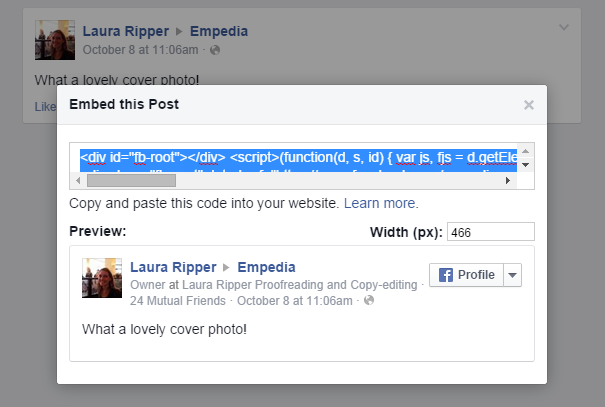 How do I delete a post or comment that someone has put on my Facebook page? How do I ban or block someone from commenting on my Facebook page? In fact, the way to do the second leads on from the first … so let’s look at how to delete a comment first. Where can I see other people’s comments on my Facebook page? You can Delete the post and ban the user, Cancel if you clicked this option by mistake, or just Delete the post (you could use this option if the user had made a mistake or posted something you didn’t want on the page but you don’t actually want to ban that person from posting on your page in future. Copy the code that’s highlighted and use it anywhere that you can place HTML – in a blog post, on a website, in a discussion forum, etc. How do I block someone from posting on my business’s Facebook page? Use the round buttons to choose whether you Allow other people to post to my Page timeline or Disable posts by other people on my Page timeline. The tick boxes allow you to choose whether to let people add videos or photos (useful to untick if people have been posting inappropriate photos but you still want to allow comments) and allow you to ask Facebook to send you posts by other people that you then have to approve (you’ll receive an email alerting you to the new post and allowing you to approve or reject it). Click Save Changes to save your changes or Cancel if you want to keep your settings as they are. I personally think it’s a good idea to allow other people to post on your business Facebook page. After all, you want to encourage interaction and conversations, not just pump out sales information, right? I get a bit frustrated if I go onto the Facebook page for a business and find I can’t place a comment about how much I loved their veggie sausages or enjoy wearing my new shoes. So, unless you are bombarded with spam and abuse, try not to use the Disable posts by other people on my timeline option if it all possible. And a word on deleting posts. Be careful what you delete. Genuine complaints and negative feedback – OK, so your first reaction will be to hide that post where someone complains the shoe they bought from your range has fallen apart. But if they’ve taken the time to find your Facebook page and complain, then they’re going to know they did that, and they’re going to notice if you delete it. What will they do then? At very least, post it again, but be assured that they will have told their friends and family, shared your page on their Facebook timeline with a note about what you’ve done, and been very unhappy altogether. Think what you’d do if you encountered them in person. You wouldn’t stick a bit of tape over their mouth or turn your back on them, would you? Yet that’s what you’re doing when you hide or delete their post. Address the issue at least partly in public – for example, you could post a reply along the lines of, “Sorry to read you’re experiencing problems. Please contact me at vvv@vvvvv.com or via my Contact Page [with link] so we can resolve your problem”. You could go further and say something like, “I’m sorry you appear to be having a problem – you can of course return your shoes to use for a full refund” and give them information on how to do this. Once the problem is resolved, pop another reply on – “I’m glad we were able to replace your shoes and hope you’re happy with the new pair – do let us know how you’re getting on. Be polite – if someone posts a little aggressively – “I’ve heard you supply slip-on shoes with fancy chains and blood diamonds on them to arms dealers: what do you say about that?” then take the polite route, and address their question in public as far as you can. Don’t get into a fight in public – if it gets messy, take it offline with an offer to call them or whatever’s appropriate. If the poster strays into the inappropriate, follow the steps above for deleting or hiding posts, but maybe consider putting a note on the page to explain (calmly) why you did this. This article has hopefully helped you to deal with negative or inappropriate comments and commentators on your Facebook page. 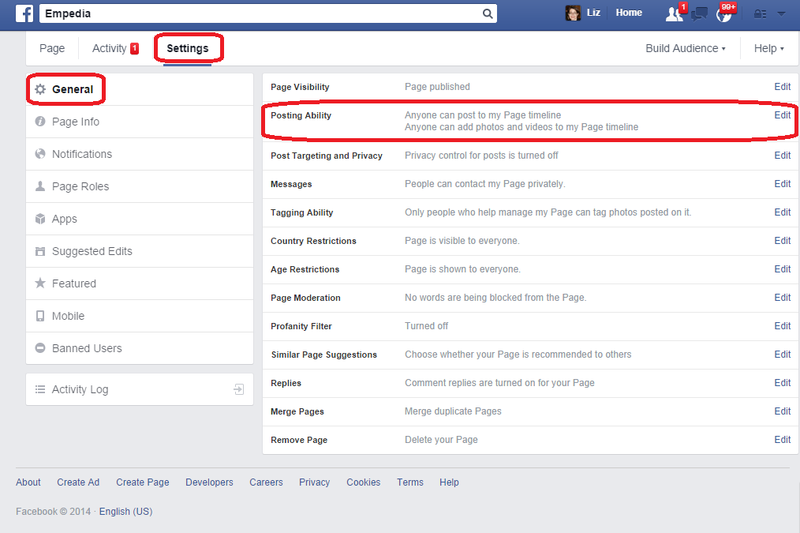 You now know how to hide or delete comments and block or ban users from your Facebook business page, and how to use the Settings to control who can post what. 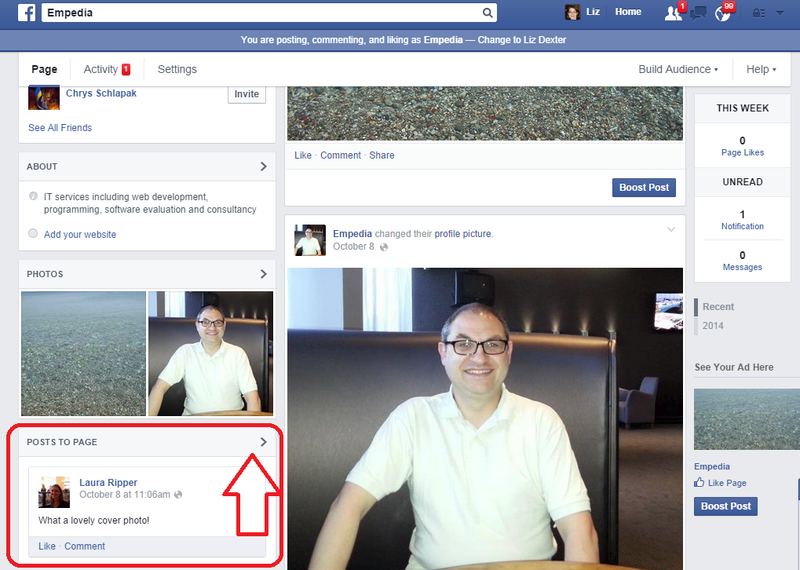 Thank you to my husband, Matthew, for allowing me to set up a Facebook page on his behalf to harvest screenshots! 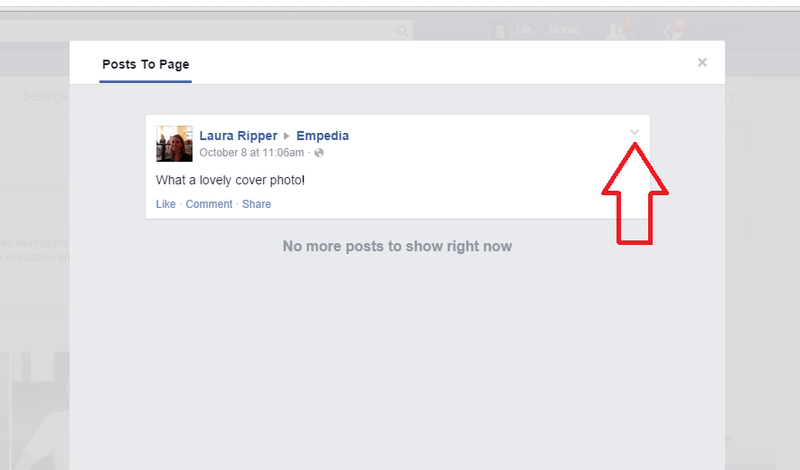 And of course, Laura Ripper is a good friend and colleague and never posts inappropriate content on people’s Facebook pages! If you’ve enjoyed this post or found it useful, please click one of the sharing buttons below! Thank you!